When there are fallen logs to collect, it’s time to bring in the Logging Truck! Help the lumberjack cut up the logs with the chainsaw, then jump in the control seat and maneuver the crane arm into position to load up the logs with the powerful grabber. Don’t forget to secure them with the chains before the lumberjacks jump into the truck and drive off with the load. Collect this and all the other vehicles in the Great Vehicles range! Includes 2 lumberjack minifigures with assorted accessories. The Logging Truck (60059) Lego set is no longer directly available from the sites below. However, 3rd party partners of these sites might still have the set available. 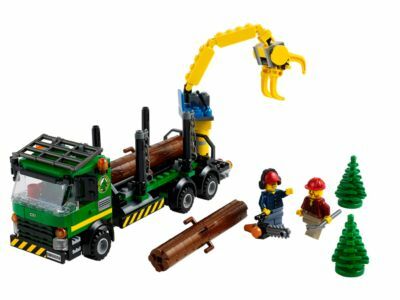 Alternate description Collect the logs with the LEGO® City Logging Truck with moving crane arm, grabber, securing chains, 2 minifigures and accessories! Collect all the other cool models in the Great Vehicles range!